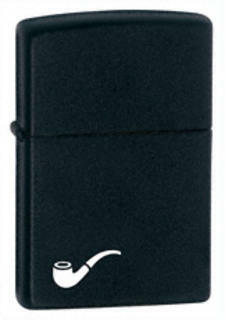 Zippos specifically designed for horizontal use with pipes. The Zippo pipe lighter is made to the same high quality standards as a Zippo windproof pocket lighter, but designed for the special needs of pipe smokers. The ingenious design encases the flame in metal, allowing it to be drawn directly into the pipe without bending over the side. The result: perfectly lit tobacco, with no damage to the pipe. 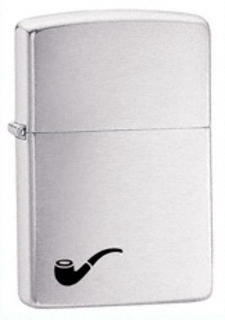 The Zippo pipe lighter is made to the same high quality standards as a Zippo windproof lighter, but designed for the special needs of pipe smokers. The ingenious design encases the flame in metal, allowing it to be drawn directly into the pipe without bending over the side. The result: perfectly lit tobacco, with no damage to the pipe. 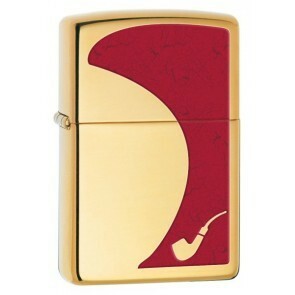 High polish brass pipe lighter with red overlay. Specially designed for lighting pipes with a removable cover over the flame allowing it to be drawn into the pipe bowl without damaging the wood of the bowl. 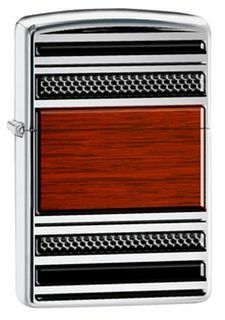 High polish chrome over brass pipe lighter with woodgrain overlay.